Hello Mime and welcome to RS. I am deeply sorry that this is happening to your friends grandmother. I know you wanted to try and help her before she gets hurt. However by the sound of what you have said it has already gone beyond that point. No matter how this ends your friends grandmother is going to get hurt from this. But please do not stop your efforts. She will need friends and family that care when the time comes. And that time will come, it's just a matter of when not if. I don't know what to tell you as far as advice on getting through to her at this point. But what I can do is try to help you understand what you are dealing with better. To put a hard point to it your dealing with an addict plane and simple. That may sound harsh but in the end that is the bottom line. And just like any other type of addict they will not respond to help until they are ready to except it. Give me a moment and I'll try to explain. Scammers are well trained at working themselves under a victims skin and into their hearts. They say all of the right things they need to, to get a victim to fall head over heals in love with them. And I can tell you from first hand experience it's a wonderful feeling unlike any I have ever felt before. It's not unlike a drug because of how addicting the nature of this love can be. The scammer makes us feel wonderful, loved, even treasured. They boost us up to a place we have never been before. And just like any other addict we want it never to stop. And without realizing it that addiction takes over our lives until we are consumed by it. Closing ourselves off to everything and everyone around us. Focusing solely on the source of that addiction. Our special someone. The heart is a remarkable organ. It is also one of the most powerful organs in the body. And once the heart has completely committed it's self to something or someone the heart can hold on feverishly and refuse to let go. The heart can override the brain and during a scam the heart does just that. But one day as Igulinka has said the evidence will become so overwhelming that the heart will have no other choice but to finally listen to what the brain has been saying all along. Unfortunately that will not be the end of it. It will only be the beginning of the worst of it. Because even when the heart understands the truth. The heart will still be in love for a time. And it was the worst pain I had ever felt in my life. And that is when she will need your love and support along with the help of her family. I understand this is discouraging news, and I wish I could say something to help with the situation at hand. But until your friends grandmother becomes more receptive to the input of friends and family there is not much you can do without her reacting back by closing you off and shutting you out. You wish to help her and right now you are doing just that on top of the daunting task that you are trying to help from the other side of the world. How hard and frustrating that must be. About the only thing I can add is maybe if you see a story or two here you think mite get through to her you could try this. Copy and paste that story or stories in a word document and send it along to the grandmother that way. Without any link back to this site. Not yet anyway. Giving scammers links back to this site is a major No-No for obvious reasons. And as you have seen there is a good chance the grandmother will go straight to the scammer for answers. I wish you good luck Mime. My thoughts and prayers will be with you, your friend, and most of all with the grandmother. And please keep us up to date. There will come a time when we can be of more help in the future. But until she is ready to listen there is not much we can do. Helpp... I dont know what to do... My step mother has fallen for a guy... He's a plain scam and ive tried every thing to get her to listen... Most of the things ive read here i have done and idk what else to do. Hes already got control of her bank account and is depositing money into it. And shes just blindly taking it out and sending it via money gram or western union.... Our family has tried to talk to her but shes snapped and gone crazy. If there's anything i can do... I have photos but idk what else that can do. And his name is philip henrisson. Please try to red flag your stepmother's name at WU and MG so at least she won't be able to sent more to scammers and at the same time to support terrorists. Online criminal groups have gone to great lengths to recruit mules in recent years. Social networks like Facebook, MySpace and Twitter have all been used to recruit individuals willing to let their bank account be used to receive a transfer from an illegal account, then forward it along. In turn, the FBI has said that it was going to be stepping up efforts to crack down on money mules. Quite simply, this is money laundering and any individual assisting these criminals can be prosecuted and have their whole bank account frozen. A conviction for an offence of money laundering may carry a penalty of up to 20 years imprisonment. PLEASE POST PICTURES, EMAIL ADDRESSES, SKYPE, PHONE NUMBERS, WHERE AND WHOM MONEY IS SEND. She is breaking the law, stealing from innocent people. It will not go well for her if she gets caught before she turns herself in. Do you have a family attorney? She is going to need one. Find one fast and see if you can get her to listen to the attorney. Hello skyeebunni please listen to and follow the advice that Pinky and Igulinka has given you. I'm no lawyer but at some point an attorney may suggest your step mother come forward to the authorities first before they come looking for her. She maybe able to claim a victim status somehow. But that option will be difficult to prove after the fact because right now she is aiding and assisting a criminal. My aunt is being scammed left and right. She is naive and falls for every scam that comes along and heads straight to Western Union or MoneyGram. Can you give me a few tips on how to 'red flag' her at WU and MG? I would love to do this but a Google search and a search of the WU/MG websites hasn't helped. How can I get her red flagged so she can't keep wiring money? Please call WU and MG directly , you will be promped to costumer service. Ask them to speak to fraud department or consumer advocate. Tell them the story . It should work. Have local FBI officer to talk to her. By sending money to West Africa she not only fills up scammers pockets but she sends money which sponsor human trafficking, drug smuggling , support terrorism. She won't get any punishment for sending her own money but if she gave her bank account and they do money laundering she could get convincted and sentenced. Please keep pailing the evidence till she will come out of the fog. If you know where she usually shops you might want to alert the attendant there in person, by talking to them. But "normally" they already know about Nigerian scam. Many victims have been saved because of an alert attendant. He tells her when to be by the phone, when to be home so he can send her checks and money to launder and who she is allowed to contact and associate with. She needs to realize that scammer won't be there for her when she will be locked at federal prison for long years . Scammers recruit all the time individuals willing to let their bank account be used to receive a transfer from an illegal account, then forward it along. In turn, the FBI has said that it was going to be stepping up efforts to crack down on money mules. Quite simply, this is money laundering and any individual assisting these criminals can be prosecuted and have their whole bank account frozen. A conviction for an offence of money laundering may carry a penalty of up to 20 years imprisonment. Scammers support human trafficking , drug smuggling, terrorism. This is where partialy money goes. That's why punishment is so harsh. There is no mercy for mules. I have been reading this thread to study about how to advise someone whose relative is being scammed. The victim is single mother, 51 years old, never married and have strong desire for getting married. 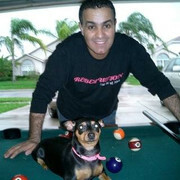 The scammer claims to be US Army Colonel in Syria, 41 years old, single and have 1 daughter who is 9 years old. The scammer said he will retire in August this year and will come to victim's country and get married, and buy a house there. Now is September but the guy never came to the victim's country. Scammer says he is busy in Syria and does not know when he will be released, and the victim believes him. The fake colonel was about to send -money to the victim, and the money was stuck at third country's custom, and victim paid tax. The relatives Ms. A and Ms. B do not know how much victim has paid. Person in contact with me is victim's niece. The victim's grown up daughter is at the victim's niece's side too. These relatives already did researches and found that the victim's story is exactly same as what are posted to the multiple anti-scam sites here and there. They have shown the information from here, the stories the victim has encountered are exactly same as what are written here. But she does not believe it. 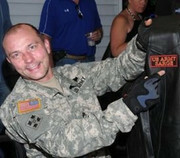 photo of different person (an US army veteran on wheel chair). They tried to convince the victim that the photo is photoshopped, but she does not believe it. I did advised to the victim's niece about what are written here in this thread. I have explained that the photo scammer uses is one of the frequently used photo of a German gentleman. And the photo victim shown then are obviously photoshopped. I also asked help for a blogger writing about scammer using same photo, and confirmed that the head of the photo-shopped picture is the one we have in the forum. I also explained that the scammers have that person's chat video, so that even if victim had chat with the person using web cam, victim should not believe that he is really there. I have advised the victim's relatives to show all links of the scam information here as evidence that the photo has been reported in 2012, before the victim met the scammer, means whoever using that photo also should be scammer. Then the relatives tried to convince the victim with all available data. The victim does not tell the relatives about the name of the scammer, and other info like SNS or email or phone number. But I believed that the photo information works. But actually did not. The victim is at early 50s, not too old. The relatives can not easily shut down victim's correspondence tools and shut down her way to handle her own money, to prevent further loss of money from the family. 1) talk to bank and Western Union, Money Gram to prevent the victim to send any money. 2) In addition, I also explained about possibility of victim being made as money mule if she keep on trusting the scammer. This should be avoided. 3) I also suggested victim's grown up daughter to talk to police that her mother is being victimized by internet scammer but the mother does not believe it and never listen to the daughter, and need advice for next step to prevent further tragedy. 2) prevent further loss of money? ?